I have been thinking about shame, or perhaps, guilt. I understand the difference between the two as being that which is public and perhaps, humiliating, and that which is suffered in private. But you might feel differently about this and I can’t see that being a problem. My grandmother, a practising – if somewhat flexible – Catholic had no patience for either emotion. For her, they demonstrated a distinct lack of character. You either took responsibility for your defect or misdemeanour, apologised and moved on, or you wallowed in the mire of self-pity like a hog. Who has time for that? “Take me as you find me”, she would say, emancipated from the desire for approval from anyone but herself. I should note here, as a polite warning – in case you were thinking of following her lead – that she was ostracised by most of her friends and family, not that she cared. I would also like to draw attention to the word emancipation: it strikes me that shame is intrinsic to our cultural expectations of femininity (being ashamed of our bodies, sexuality etc) and that my grandmother was then doubly emancipated. I lack character. I am guilty. I feel shame. I’m writing this in Cuba and, for my trip here, I have attempted to learn Spanish. It’s these two facts that have contributed to my preoccupation with shame. Firstly, the obvious: I am suffering the flabby, petulant guilt of the (relatively) privileged, rubber-necking tourist who is snapping photos of picturesque dilapidation, horrendous poverty and want, while enjoying the inexpensive beer and cheap travel. 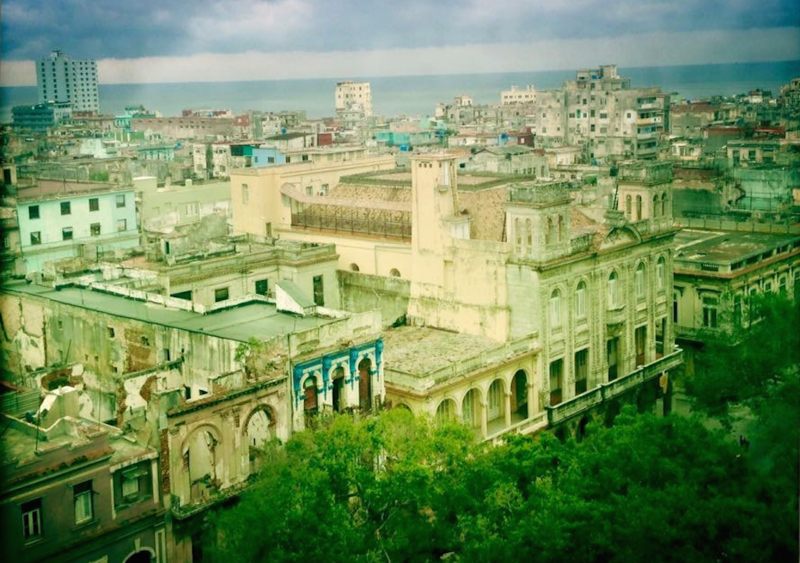 I’ve come here, now, before the Americans “ruin” Cuba – a detail for which, when talking with a local over a Cuba Libre, brought admonishment for my “romanticism” and ignorance. He’s right, of course. I am guilty. Added to this, there’s the language. One form of sorry in Spanish is “disculpe”, the word’s Latin root gaudy and redolent of the Confiteor, the prayer of confession which resounds with “Mea culpa, mea culpa, mea maxima culpa”, which translates as “my fault, through my fault, through my most grievous fault”. I am seduced by these ornate and sumptuous words, so much more ravishing than the shirking half-shrug of “I’m sorry”, or worse, “my bad”, which compounds the transgression with a travesty of language. I’m a snob. Mea culpa. I’ve much to feel ashamed of, much to feel guilty about. I won’t list it all here, because, while it’s true that I lack character, I do have some discretion. But if I were to make a confession, I might start with how I love someone I shouldn’t – though, to be honest, that is only a sin of nostalgia for a romance long gone and idealised (sanctified, even) in my silly head. It was he – the beloved – who pointed out my lack of character, during an argument that proved (though we couldn’t know it at the time) to be the fulcrum of our doomed love affair. It was also he who pressed his right hand over his heart and said “Mea culpa” when he refused to visit me in the mental hospital. I would follow this with how, when I was little girl, each time we made a new start – a new dad, a new school or home – I would promise myself that I would stop telling lies. I would write this resolve down in my diary or schoolbook: “Be better, NO LIES! !” But I would lie – I couldn’t stop myself. I’d boast that I could do the splits, or somersaults, or that I had every single Star Wars figure and a Barbie house and every kind of My Little Pony, because I wanted people to like me. But no one likes a liar. No one. I might add that I was a thief. I used to steal food, books and clothes – from necessity, you understand, and now, very rarely, for kicks and to stay sharp. You never know when you’ll need certain skills again. My mother taught me how to steal, though I don’t mean she gave me lessons. Just that she couldn’t afford to both feed and clothe us, so she bought the food and stole the clothes. She had a lot of tricks – getting us dressed in the changing rooms and leaving our old clothes and the ripped-off security tags behind, or folding the clothes up and hiding them under my sister in her buggy – but the best was when the old lady next door died and she had a mail-order catalogue send deliveries there, and let the dead lady accrue the debt while we collected the parcels. That was a good Christmas. Also, I would admit to lacking substance, or grit. I am flimsy. The kind of girl who floats through, a drifter; it’s not that I don't want to belong or to stick at things, more that I don’t think I deserve to be there, and it’s always better to leave than be rejected. Anyway, everyone else has always seemed party to a belief that what they were doing or believed in was enough, that their way was THE way, and this particular faith has always eluded me. So, I tried my hand at being a goth, a B-girl, a skater, a hippy, a geek. I tried writing graffiti and steaming trains; I tried raves in fields; I had boyfriends who took me along when they robbed off-licences, my school uniform giving the police a place to start their questioning. I took acid and ecstasy and speed and coke and smack and pills. I married and divorced the son of artists who indulged in a decadent nostalgia. I tried being a stripper and drinking too much and I tried working in an office. And none of it was dangerous or touched me, because I was always just drifting through, which was partly cruel because someone always believed I was going to stay (and sometimes that was me) and partly because I was just trying to get along. Shame had always been the dark seam binding my DNA, and to stay was to be discovered, finally. Or to stay was to be disappointed, finally. There are other sins and crimes, of course. Greed and lust and cheating and deceit, all of which are marked somewhere on me, no doubt. And so, I confess. I am guilty, I lack character, I am ashamed. What else can I say? Mea culpa. Mea Culpa originally featured in Issue 1 of Somesuch Stories, which is available to buy here. Heidi James is an author and academic, her latest novel, Wounding, was published by Blue Moose Books.